SEM DUAL STAGE Systems are just that, a two stage destruction system consisting of both a primary and secondary destruction device. 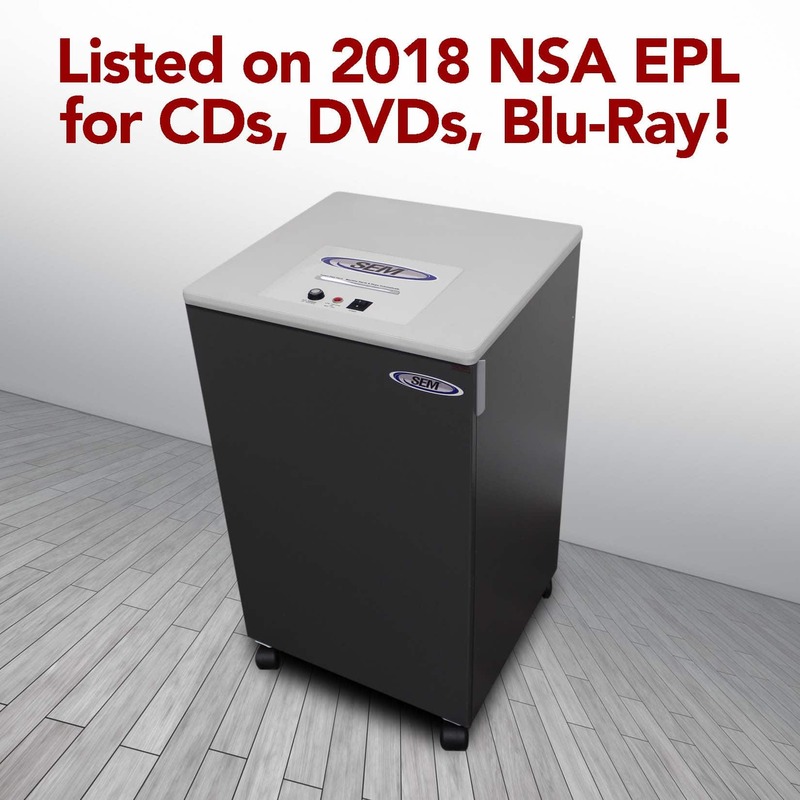 A Heavy Duty Bulk Pre-shredder serves as the primary stage,allowing for oversized items such as rolled architectural drawings, full burn bags, large manuals, and high volumes of bulky material to be reduced in size. This allows for the secondary stage, consisting of a rotary knife mill disintegrator, to more easily and effectively reduce the waste down to its final NSA evaluated 3/32” particle size. 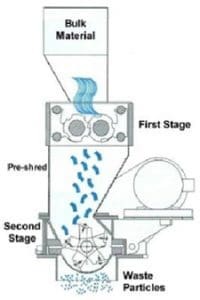 By utilizing a Pre-shredder as the primary stage, a smaller more energy efficient disintegrator can be utilized for the secondary stage. Additionally, the 5 Bladed SOLID Rotors achieve more throughput with less HP than open rotor designs through increased cutting inertia and more cuts per rotation. Single stage destruction systems require much larger disintegrators and much larger amounts of HP in order to destroy the same volumes and thicknesses of material. As with all single stage systems, many items have to be sorted, resorted, and then reduced in thickness prior to destruction. This is just unproductive for any volume of bulky items. Dual Stage Systems can easily handle these applications, and are simply the fastest, most efficient way to destroy classified bulk material. Why spend all the extra work sorting and pre-shredding the items yourself prior to destruction? Let the Dual Stage system do the work. Dual Stage Systems also prevent overfeeding and system jams. Anyone familiar with disintegration knows there is that possibility for a jam somewhere or sometime, usually right before you head out the door. By pre-shredding the material the disintegrator’s workload is greatly reduced, while less energy is required by the disintegrator to destroy the bulk material. This also saves disintegrator blade wear at the same time. Couple with an SEM Recyclable Waste Briquetter for additional LEED point accreditation.